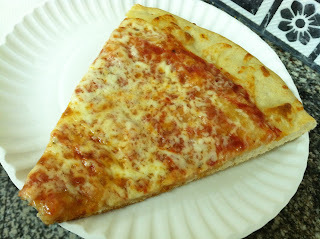 On the NY pizza spectrum, 99c is the best deal per slice. The other end of the spectrum is probably Naples, an upscale Italian restaurant in Midtown. As luck would have it, I had to eat on the run twice this week. Once I grabbed a slice of mushroom mozzarella from Naples (second visit there), and the other a 99c pizza from Lexington and 46th (first time experiencing the cheapest street grub!). ...bland vs. tasty. Guess which is which? 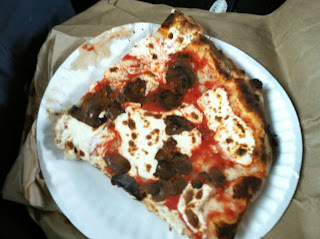 Naples on the other hand - and I know I'm probably refuting my previous Naples entry - was pretty bland. The mozzarella, although fresh, was tasteless. Nil, zip, natta. The mushrooms didn't really add to it. Someone told me later that I should try the three cheeses pizza, but I think after this 99c experience, I'll stick with the cheaper and tastier one.